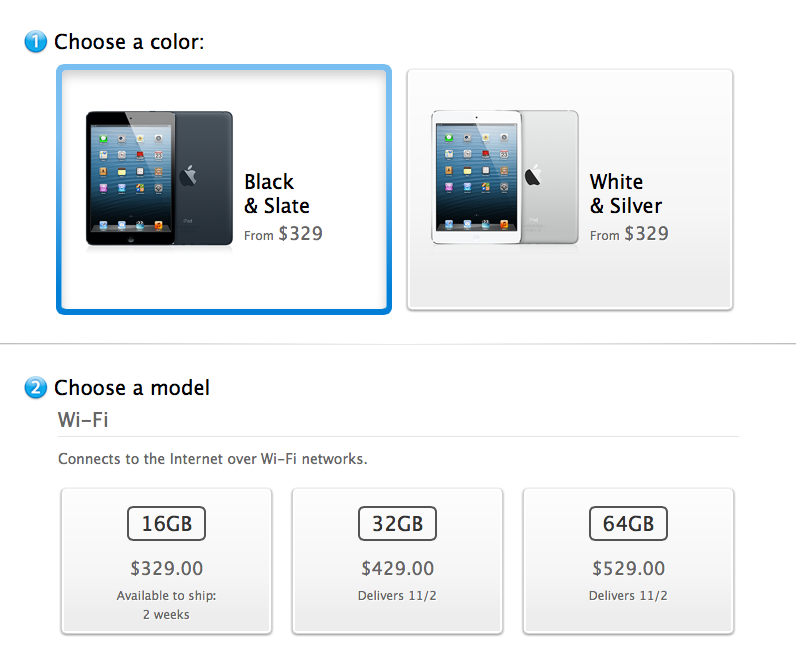 Initial stock of the iPad Mini in white and 16Gb iPad Mini in Black have been sold. If you didn’t get one you will have to take your chances on Friday to get one. The 32/64GB Black Models however are still available. iPad Mini Pre-Orders are Live! Did you get one? 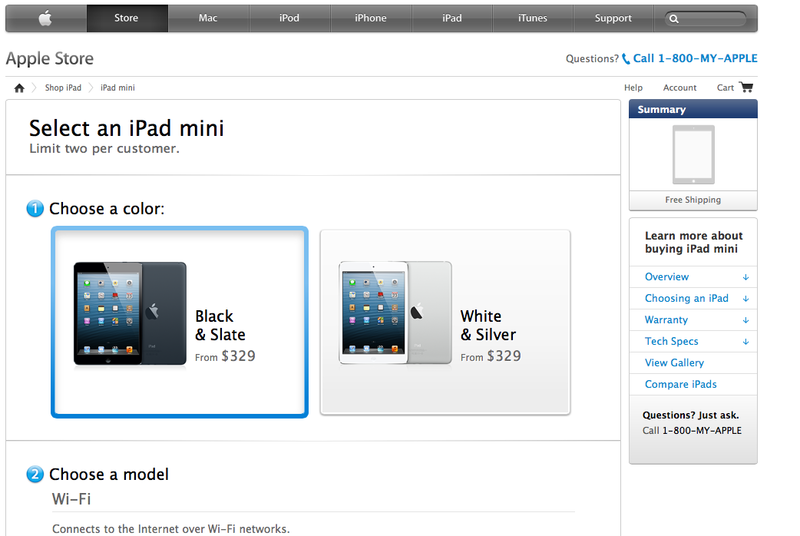 The new iPad Mini is now available to pre-order through the Apple Online Store and Apple Store for iPhone App. The servers are a little buggy but are having no trouble to keep up with the demand. Good Luck to everyone trying to get an iPad Mini and our full review will hit when I get the device. I got the basic 16Gb Wifi in Black that delivers 11/2 instead of the Cellular which has no release date yet. However it is 3:20 AM as of me writing this with school in the morning so I will be saying goodnight to all of you! Good Luck! I am late on this yes but I haven’t been feeling well if you follow my twitter so stick with me here. The new iPad mini is set to be announced soon. Actually October 23rd according to many sources and it is actually what you think it is a smaller version of the iPad. There is no say if the iPad mini is going to have a retina display but you will have a 7inch display for your viewing pleasure. Also of course you will have the new lightning connector currently shipping with the new iPods and iPhones. Of course the new iPad Mini will have LTE support much like it’s big brother but will run you some extra cash for the extra antennas. Of course if you want the wifi one you can always pick that one up for a lower price. Along with the notorious iPad Mini rumored ever sense the iPad first came out we should see a 13inch retina MacBook Pro. We saw the first retina MacBook Pro come out a couple of months ago and it has a gorgeous screen USB 3.0 and a new thinner DVD-less design sort of like the MacBook Air. The MacBook Air is being worked on at Apple and if we don’t see it with the new Pros then we are going to have to wait till the summer. So both of these devices are expected to make their way into the official world on October 23rd and when they go on sale is anyone’s guess. Ahead of Apple’s special october event to show off the “iPad Mini” reports are coming out showing what the device could like like. 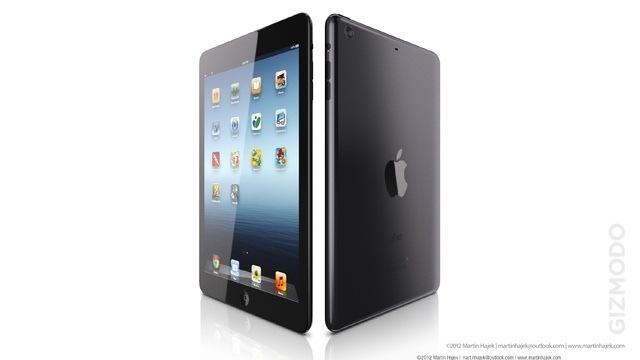 The images appear to be close to the iPad Mini design information we have been hearing. Note that the dock is the new 9-pin connector we have been seeing on iPhone mockups. The device shows little bezel around the right and left of the screen. However I still see the iPad mini as pointless it could be a good idea for someone who would want a small e-reader. 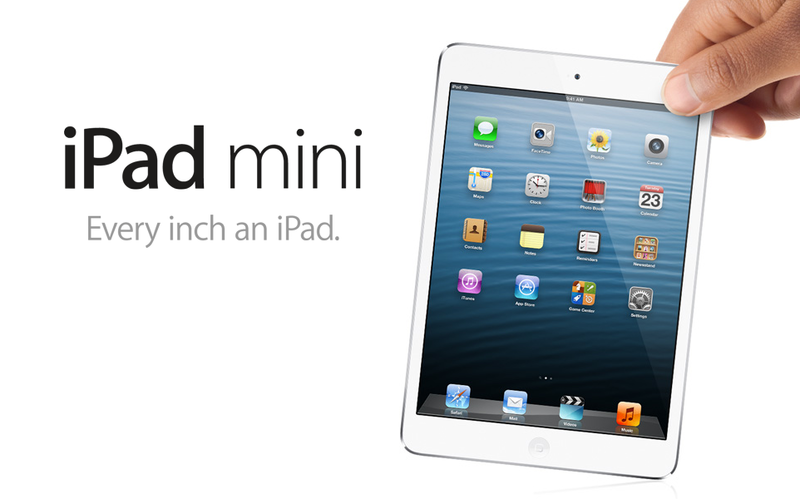 The iPad mini is rumored to be 7 inches and to be announced at it’s own event in October. The device is rumored to take rumored characteristics from the New iPhone which is rumored to be announced September 12th and go on sale September 21st.